Cucumber and carrots are full of fiber and essential vitamins and nutrients. While cucumbers contain cucurbitacin E, a powerful anti-cancer compound, carrots contain carotenoids, which are important for eye and heart health (23,24,25). Fat increases the absorption of carotenoids, so pair the vegetables with homemade anti-inflammatory hummus. Instead of reaching for a bag of chips or a candy bar, grab a fruit as you reach for your keys and head out for the day. Foods like bananas, apples, grapes, nectarines and oranges will satisfy your craving and your hunger without compromising your weight loss efforts. For a quick bite on the weekends or a simple hors-d’oeuvre for your guests, slice a few cherry tomatoes and a bit of cheese and garnish with fresh basil. The tomatoes ill provide vitamin c and the ever-powerful lycopene while the cheese will fill you up with protein and vitamin b12 (26,27,28). For the perfect snack-sized portion, combine 1 cup of cherry tomatoes with 2 oz of mozzarella. Chia seeds don’t have much flavor, but they do contain antioxidants that fight inflammation and protect your heart (29, 30). Chia seeds can be eaten raw, but it’s best to soak them in water to create a gel-like substance you can be used in smoothies, baking, and desserts. 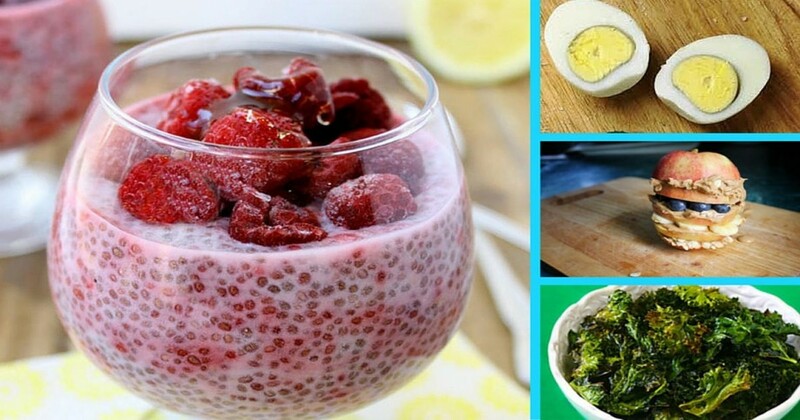 Combine chia seeds and water in a small bowl. Cover and refrigerate for at least 30 minutes to let the seeds transform into a gel. Stir in cocoa powder, peanut butter, and sweetener and enjoy! For a quick and filling snack, munch on 2 hard boiled eggs. They’re full of protein, vitamin B12, and K2 as well as brain-healthy cholesterol (31). Plus, they make for a quick and convenient snack ! Cheese is filling, delicious and nutritious. Contrary to popular belief, cheese doesn’t increase your risk of heart disease or raise your cholesterol if eaten in moderation(32,33,34,35). Just make sure not to eat more than 2 oz during snack time. Jerky can bag rest high-protein snack, as long as it doesn’t contain any preservatives, additives or sugar. Keep in mind that it shouldn’t contain too much sodium either. For the highest quality jerky, look for organic grass-fed beef at your local health food store or butcher(36). Protein shakes feed your muscles and supply clean energy to keep you going in between your meals. While you can use whey protein or other alternatives, hemp contains omega-3 essential fatty acids, iron, vitamin E and GLA (gamma-linolenic acid) (37). Plus, hemp protein is less likely to contain sugar or other additives and does not promote inflammation like proteins derived from dairy do. To use, simply follow package instructions and avoid too close to meals. If you’re going on a camping trip or simply a long drive, pack some canned fish with you to keep your stomach full. Prioritize wild salmon and sardines over tuna and other heavy metal-rich fish. This type of snack will feed your body with omega-3 fatty acids, protein, potassium, magnesium, and vitamin B12 (38). Just make sure to buy from a brand that’s BPA-free.